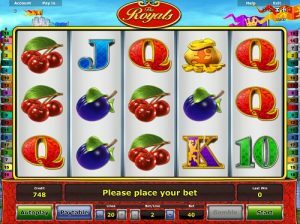 The Royals is a classic, vintage-feel, 5-reel, 20-payline slot game made by Novomatic. Beginners will really love this game, especially those who are looking for something a bit more advanced than a simple 3-reel, 5-payline slot but not one that’s way too over-complicated. This slot is just right – it’s in the goldilocks zone! It’s also a brilliant game for slots experts who’d like to go back to basics and recreate and reignite some old-school slot magic. The background of this slot is a stone castle with its turrets and walls covered with beautiful pink flowers! From the outside it would look foreboding to the enemy but from the inside it would feel like a wonderful, safe haven for its residents. Players who are fans of other similar Novomatic slot games like Reel King Potty and King’s Jester will no doubt enjoy this slot game immensely. The first slot machine was invented well over 100 years ago but symbols haven’t changed all that much, well not in old-school slot machines anyway! There are two different types of slots players: modern and classic. Modern slots players like their slots to be complicated, full of insane graphics and fancy bonus games. Classic slots players, on the other hand, like down-to-earth, simple slots that are easy to understand but entertaining and rewarding to play. After all, what more do you need from a slot? The symbols in this game will delight all old-school slots fans as, from the least-paying to the most-paying there are: the juicy cherries, the ripe plum, the 10, the Jack, the Queen, the King and the pot of money! Symbols pay from three or more matches. Matching symbols need to fall on a payline, on consecutive reels starting from the leftmost reel. Payouts will vary according to bet amount, which can be easily increased or decreased at the bottom of the slot screen. Check the paytable to see exact payout amounts and more rules on the game. There is one more symbol that appears on the reels of The Royals slot game and that’s the Wild symbol! The Wild symbol is a happy Jester holding a sign reading ‘Wild’ and he and his sign can substitute for any other symbol on the reels, helping you on your way to getting those big wins! The Royals feature helps you get even bigger wins and this can be triggered at any time: after a winning or even a losing spin! The Royals character will turn up (the Queen, the King or the Prince) and their belly will be full of mini reels! These mini reels have lots of different coloured sevens on them. Spin their belly reels to reveal a winning combination, and spin again to keep going. The feature will end when you spin a non-winning combination. Check the paytable for winning combinations and payout amounts. The Royals slot game has some super-duper classic Novomatic features. Firstly, you can play this game for free until you’re ready to play for real and NovomaticCasino.co.uk tells you all of the best online casinos where you can play Novomatic games, including their table games and live casino games. for real online! You can gamble your wins in The Royals, too, using the feature. To double your win and go up a step, all you’ll need to do is click whilst the light of the step is on! If you time it right, you’ll climb upwards and multiply your winnings by 2! If you get it wrong, however, you’ll be back at the reels with nothing! Autoplay is great as it allows you to win without having to put in any effort at all! The reels spin themselves and you can just watch the wins roll in. The only thing is, you won’t be able to gamble them or alter your bet while this mode is on.